University Air Squadrons (UAS) from across the UK competed in a Dragons' Den style challenge to secure expedition funding from the RAF Charitable Trust. The Paul Bowen Award offers an annual top prize of £15,000 to the UAS that plans the most adventurous and ambitious expedition that, in the eyes of Trustees, helps individuals develop both leadership and life skills. Students from the East of Scotland Universities Air Squadron (ESUAS) won through with their 14-day trek in Mongolia called Mongolian Endurance. 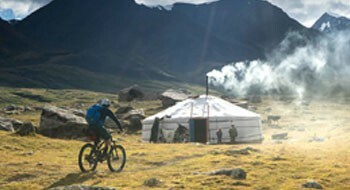 Setting off in July 2019, 12 students will take part in a gruelling 589km mountain-bike adventure across central and western Mongolia during which they will be entirely self-reliant for survival. Reflecting on their win, Sqn Ldr Jonathan Finbow said: "We are thrilled and grateful to have won the Award. We experimented with a new style of pitch this year by editing a short video to show our vision of the expedition; to our delight, the idea paid off! "Mongolian Endurance is a once-in-a-lifetime opportunity that delivers adventure, challenge and personal development while directly preparing selected individuals for a RAF career. Thanks to the Trust, we can appreciate first-hand what a tremendous prize the Award is." ESUAS have wasted no time in beginning the training and selection process for the expedition, with teams of budding applicants transiting the RAF100 Baton across Fife. "We chose cycling so that everyone in the squadron could get involved, however only those that show sustained organisational and physical commitment will make the final twelve - although many others will benefit along the way", Jonathan explained. RAF Charitable Trust Director Justine Morton said: "It was exceptionally difficult to decide between the final 3, all promise to be challenging, unusual and exciting expeditions - exactly what we asked for. However, ESUAS just eased ahead with an exceptional idea that will be the first of its kind for a UAS." Due to the high standards of entry this year and as a special occasion to mark RAF100, the Trust awarded not one but two runners-up prizes of £10,000 - to Cambridge University Air Squadron (CUAS) and Northumbrian Universities Air Squadron (NUAS). CUAS plan to use their prize money to help 10 students and two members of staff undertake an 18 day hike along 257km of the newly formed Jordan train from Dana to Aqaba. NUAS are using their winnings to help fund their Icelandic Highlands expedition, which will see 12 students trek and mountain-bike from the northern to southern coastline.